There’s something so enriching about getting outside and observing nature, creation, and the beauty that surrounds us in the natural world. It’s in these quiet, mindful moments, as you connect with the beauty and inspiration that lies hidden all around you, that creativity can flourish. In this class, we’re going to step outside with a journal in hand, and find our way back to the simple pleasure of being immersed in nature. If you truly love nature, you will find beauty everywhere… and once you start to really observe the beauty, you’ll find it an endless source of inspiration for your nature journal or sketchbook. Inspired By Nature is all about taking that inspiration and using it to ignite your imagination. I’m going to guide you and your paintbrush through the creative process from the very beginning. As we explore sketching, color palettes, hand lettering and lots of different painting techniques! Your nature observations will spill out onto the pages of your journal in a beautiful, inspired way. Are you a nature lover at heart, but distracted by the demands of a busy life? Does your cluttered mind, filled with racing thoughts and endless to-do lists keep you from pausing to notice the tiny miracles unfolding around you every day? Do you want to find your way back to the simple pleasure of being immersed in nature? Are you curious about establishing a nature journaling or art/nature based mindfulness practice, and exploring the space where nature meets art? Ready to tap into the endless inspiration that surrounds us in the natural world, and unleash your creativity through a flexible and forgiving painting medium called gouache? 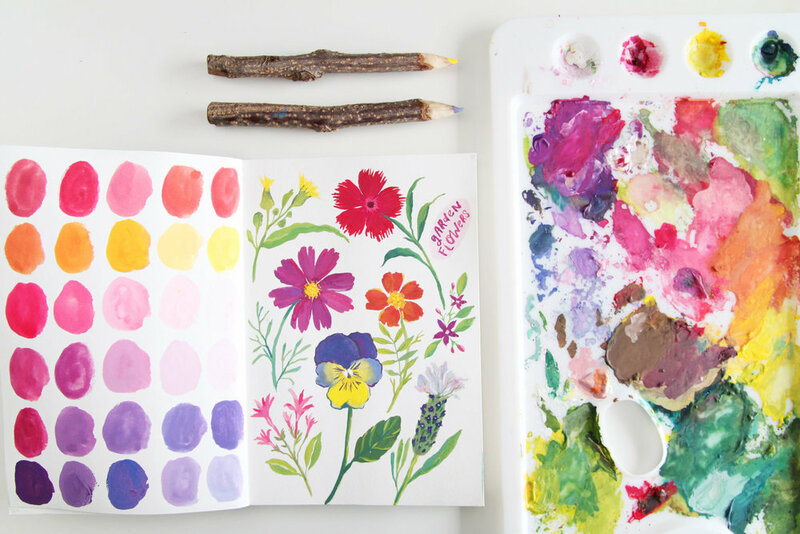 Are you curious about getting to know gouache as an art journaling medium? If you found yourself nodding to any of those questions, than press pause on your busy life, kick your shoes off, pick up a paintbrush and escape into nature with me! We begin our class with a chat about those blank page jitters, and how to overcome them. Then we step outside and start exploring the natural world around us with childlike curiosity - as though we’re seeing it for the very first time. We get down very close to the ground, and start to notice all of the little things - the beauty, and inspiration that was lying hidden all around us. We start looking at leaves, and taking time to notice all of the different shapes and colors. We begin our nature journal by sketching all of the different leaf shapes that we notice, and we experiment with pen and line drawings. This lesson is all about leaves, and using the leaves from our wanderings as inspiration for some beautiful pages in our journal. We begin by replicating the colors of our found leaves using the three primary colors, and I guide you as we adjust colors intuitively on our palette. Then we experiment with a loose, fluid painting style over our line drawings. We play around with our collection of leaves, arranging them in a circle before using the arrangement as inspiration for another page in our journal. Our last leafy exercise is a hand lettered quote, on a colored background surrounded by painted leaves. We begin this lesson by stepping outside again, and this time we’re looking for little pops of colour in our surroundings. You’ll be amazed at what you find when you really slow down and take a close look around you! We’ll begin another page in our nature journal by focusing on the shapes of all the different flowers that we found, sketching in their outlines. We experiment with colours again, this time mixing all of the beautiful, bold floral colours with the three primaries! Then I’ll guide you as we paint a collection of flowers, and your creativity will bloom as the flowers emerge from your page! This lesson begins with a memory challenge! We’ll practice strengthening those observational skills before painting a hibiscus (or flower of your choice) entirely from memory. Follow along as I share my intuitive painting process and gain a deeper appreciation for just how flexible and forgiving gouache is as a painting medium! Then we’ll explore the way that a colour palette from one page, can inspire an entire new artwork. We’ll bring a cheeky galah (Australian bird) to life using the same area of our paint palette, and we’ll experiment with adding tissue paper texture into his wings for a little extra playfulness. Let’s combine all of the skills that we covered in the previous lessons, and create a beautiful cover page for your journal! We’ll also experiment with incorporating some pressed flowers to the page, which will add a little extra magic! I’m a painter, illustrator, artrepreneur & creativity kickstarter. I’ve been rebelling against the 9-5 grind since 2008, tenaciously carving my own creative path and changing my world one brushstroke at a time. I believe that creativity is at the core of who we are as humans, and that each person has unique talents and abilities that should be explored and nurtured. For the past 10 years I’ve been exploring my own creative potential through painting, illustrating, making and writing. My art is bright, happy, illustrative and always inspired by nature. In my work, my love and appreciation for the beauty that surrounds us in the natural world is intrinsically intertwined with my passion for color and creativity. The magic happens when I’m able to capture the essence of nature, and the wonderment of the world around me on my canvas or page. My world is colorful, and I like to bring a playful spirit to a blank page, but I’m also in an ongoing struggle with my inner perfectionist which sometimes creates an awkward tension as I paint. I am learning to quieten my mind and let go of the fear, surrendering to the creative process with more ease. I’m passionate about inspiring others to explore their creativity, and giving them the tips and tools they need to unlock their creative potential! In 2017 I founded Deanna Maree Creative Studio, and began teaching painting through online classes, sharing my own insights into the creative process and helping my students embrace imperfection and get that paint flowing! When I don’t have a brush in my hand, you’ll most likely find me outdoors, sitting by a creek or river listening to the sound of birds singing, climbing a mountain, or exploring some place new. Nothing makes me happier than sunshine on my back, wind in my hair and soft grass underfoot.